Taking Flight As public information specialist for the airport in Austin, Texas, Kaela Harmon ’05 combines data analysis with creativity for the aviation industry. Kaela Harmon’s passion for airports goes well beyond being fascinated with planes and travel. “An airport has its own dynamic flow,” she said. Although she’s still new to a job as public information specialist senior for the Austin-Bergstrom International Airport in Austin, Texas, Harmon ’05 has spent the last five years working with airports and the communities they serve. “The work is very dynamic. It’s a perfect blend of analytics and creativity,” she said. Kaela Harmon ’05 promotes her children’s book. 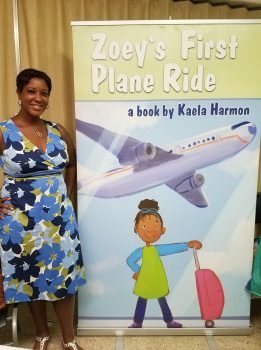 The experience inspired Harmon to write and self-publish a children’s book, “Zoey’s First Plane Ride.” While other books focus on airplanes, Harmon wanted to “pass along my enthusiasm for airports.” She walks the reader through every step — checking in at the kiosk, checking luggage and explaining where it goes on the conveyor belt, walking the concourse, understanding airport signage, boarding the plane — all the way through to baggage claim. Harmon developed her talent for writing and communications through her major in broadcast journalism and communications. Her high school guidance counselor in Columbia was a W&L graduate — one of the first female, black students on campus — and introduced her to the university. Harmon spent six weeks on campus for a summer-immersion program, and after applying, she returned for a visit. Walking along the Colonnade, “I felt I really needed to be here,” she remembered. She values the professors who inspired and mentored her. “Bob de Maria was one of those rare people who took you under his wing and pushed you to be better,” she said. Professors Dayo Abah and Claudette Artwick also stand out as important to her professional development. As a young black professional, Harmon said, she never wants to lose sight of the fact that “I’m standing on the shoulders of giants. Many made sacrifices to give me opportunities.” She hopes to continue to lay a foundation for those who come after her.